100 years on, is history repeating itself? A century ago, a crisis in eastern Europe escalated into the first world war. As a result of agreements and affiliations, what started as a regionalised dispute between the Austrian empire and Serbia quickly spread to engulf the major European powers. The Germans backed the Austrians with their dispute with Serbia. Serbia, also known as the Southern Slavs (from which came the name Yugoslavia later) was backed by Russia, its Slavic cousin. As the conflict began to widen, Germany, believing it could quickly nullify France before turning its attention to attacking Russia, invaded Belgium in its move against France. This then involved Britain, who had a previous agreement to defend Belgium in the event of attack. And so the horrors of World War 1 began. These things have a habit of spiraling out of control once events are in play. What is happening in Ukraine at the moment, for me, has ominously familiar overtones of the above train of events. Ukraine is a country that has increasingly faced in two directions since the fall of the Soviet empire in 1991. To generalise, half of the country wants closer ties with the West, in the form of the EU and NATO, while the other half wants closer ties with its neighbour to the north and east, Russia. When I visited Kiev in 2011, this became quite apparent to me. The situation is complicated, since Ukraine in general, and Kiev in particular, has significant historical and cultural ties with Russia. Indeed, Kiev was the original capital of Russia, once known as Kievan Rus. 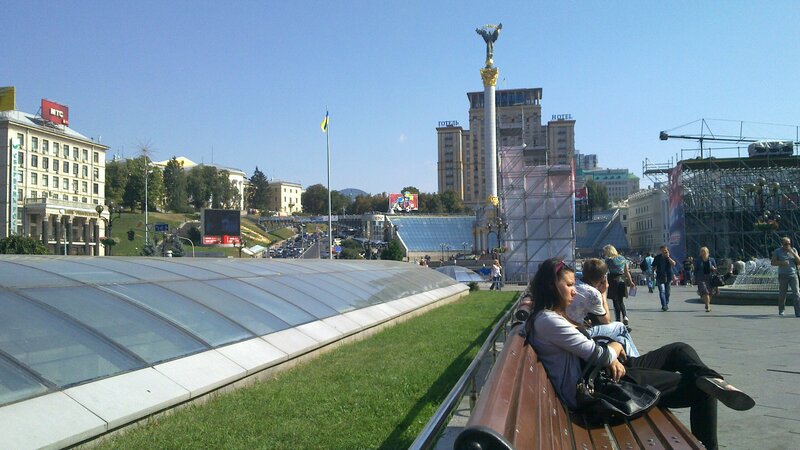 Independence Square in Kiev, September 2011, a far cry from the bloodshed and chaos of recent weeks. So the recent overthrow of the Ukrainian president Yanukovich by a popular uprising of the pro-western population is seen as a Fascist coup d’etat by the pro-Russians. And now that the Russian President Putin is aggressively mobilising troops, the situation between Ukraine and Russia is turning very ugly indeed, and has the potential to spiral further out of control just as it did in 1914. Once again, Britain finds itself in an agreement to defend another country (for Belgium 1914 read Ukraine 2014). The Budapest Memorandum of 1994 was an agreement that Britain, the US, Russia and Ukraine signed in order to protect the territorial integrity of Ukraine in the post-Soviet period. Only God Himself knows whether history will be repeated, but it seems clear that the potential for a major conflict is shockingly present in the events currently taking place. A former British ambassador, Sir Tony Brenton, has been quoted as saying that if Russia does indeed invade Ukraine, and if the Budapest Memorandum is legally binding, ‘then it’s very difficult to avoid the conclusion that we’re going to go to war with Russia’. Is that really a possibility? Surely not, you’d think. Certainly you’d hope not. But as has been mentioned above, events historically have shown how easily and horrifically they can lurch out of control. Let’s hope and earnestly pray this doesn’t happen again.